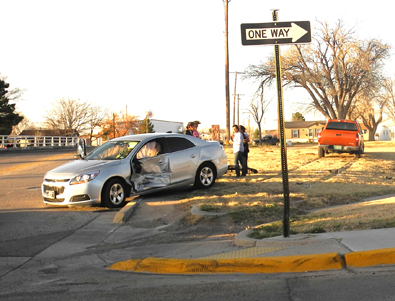 Traffic along Seventh Street near the Eagle Draw bridge was diverted for a time Thursday afternoon as Artesia Police Department officers and EMS crews worked the scene of a two-vehicle accident at Seventh and Mahone Drive. The collision around 4:20 p.m. sent a pickup truck into the grass along the Draw and caused severe damage to the driver’s-side door of the car pictured above. No further details were available at press time.